The PERRIN Performance Radiator Shroud caps the top of the radiator for a sleek new look and forces all available airflow through the core. This lowers operating temperature and increases power. Available in Black or Red powder coated aluminum. All feature a silk screened PERRIN logo for that hot/cool look. Made from aluminum, it is corrosive proof in those states with salt used during the winter time. This PERRIN Performance product features a durable powder coat finish. 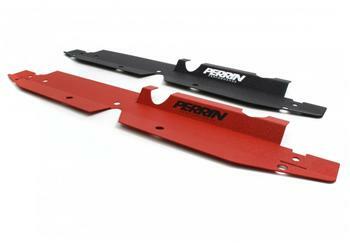 PERRIN powder coating is available in either red or black and are accented with a wrinkled texture finish.